Apricot Pumpkin Bread is a unique take on classic pumpkin bread recipes. Sweet chunks of dried apricots add a nice texture and fresh-squeezed orange juice brightens the flavor. 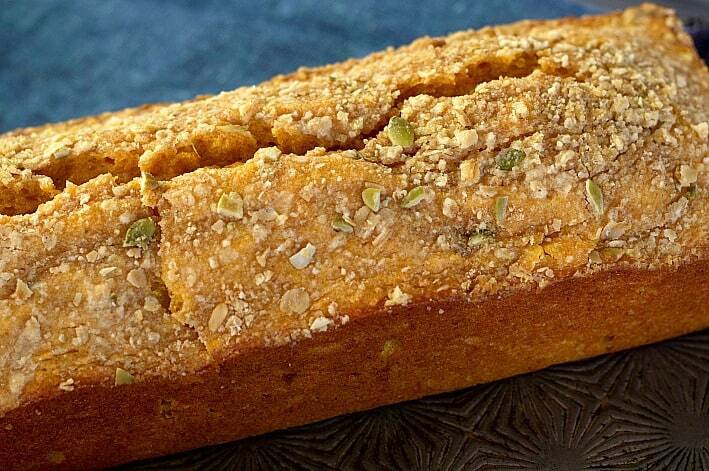 Topped with a pepita seed streusel, this is a pumpkin bread worth sharing. Apricot Pumpkin Bread is infused with wonderful spices of cinnamon, nutmeg, cardamon and ginger. Fresh orange juice is also added which pairs so wonderfully with the pumpkin. Sweet, dried apricots get soaked in water or liqueur, chopped and folded into the mix for even more moist bites. I’ve reduced the amount of sugar called for in the original recipe and added a crunchy streusel topping with pepita seeds for extra texture and flavor. Since I’ve reduced the sugar, the top of the loaves will crack a bit. 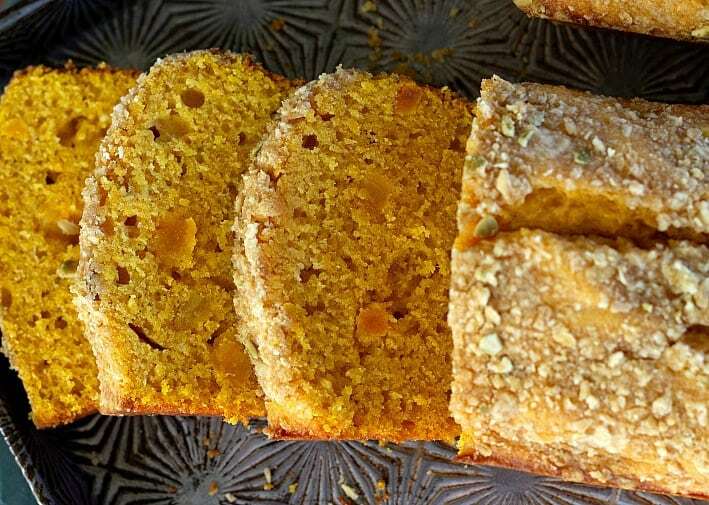 This still creates a beautiful loaf and with the lower amount of sugar, the texture is also more moist and the flavors of the spices, pumpkin and orange juice get to shine all the more. 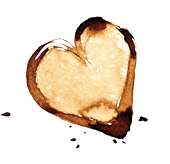 So don’t stress over the “beautiful” split in the top of your bread. For successful bread-baking over and over, I encourage you to read the recipe notes I’ve provided for you below in the printable version. Also, the bread shown in my pictures was baked in really cool, longer and narrower loaf pans than your standard 9×5 loaf. This creates more, though slightly smaller slices than the classic slice, but we love them this way. I got the loaf pans off of Amazon. Please note, if you purchase them from my link, I receive a small commission. Apricot Pumpkin Bread is perfect for neighbor gifts over the holidays or on the treat table at any party, I think you’ll agree that it needs to be enjoyed all year long. 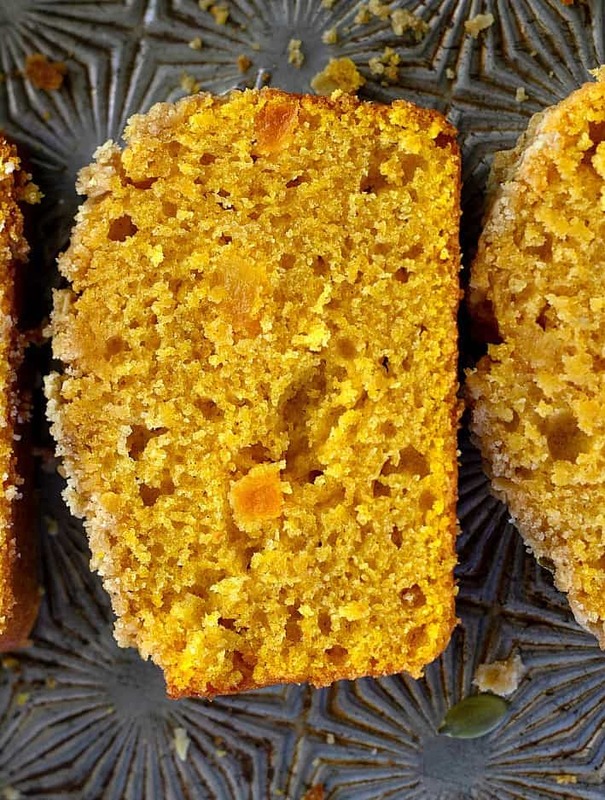 This Pumpkin Bread is sure to become a favorite! It's one of the most unique of it's kind, using chunks of dried apricots throughout the loaf and flavored with fresh orange juice, cinnamon, cardamon, nutmeg and a touch of ginger. The loaf keeps well on your counter for two days, and in the refrigerator for a week. In the bowl of a food processor, add the flour, sugar, and salt. Pulse just to blend. Add the rolled oats, pumpkin seeds, and cold chunks of butter. Pulse about 5 times for 2 seconds each until the mixture resembles small crumbs and the butter is distributed throughout. Place the streusel in the fridge until you need it. (You will have more than you need. This topping can stay in the fridge for a week or be frozen for several months to be used again. Place the chopped apricots in a small sauce pan with water, just enough to cover. You may also use any orange flavored liqueur if you like. Let the mixture heat until it just barely starts to simmer then remove from the heat. Let the apricots sit in the liquid until ready to add to the recipe. Preheat oven to 350F degrees. Lightly grease the bottoms and 1/2 inch up the sides of two 9x5-inch loaf pans; set aside. In a large bowl stir together the flour, sugar, soda, salt, cinnamon, cardamom, nutmeg and ginger. Set flour mixture aside. In a medium bowl add the eggs and beat them with a fork until kind of fluffy. Add the pumpkin, oil, and orange juice. Add the wet mixture to the flour mixture; stir just until moistened. Drain the water or liqueur off the apricots and gently stir them into the pumpkin bread batter. Stir until no more streaks of flour are present. Spoon batter into prepared pans. Get the streusel topping from the fridge and sprinkle liberally or lightly over the loaves, whichever you prefer. Don't make the streusel layer too thick. Bake 45-50 minutes or until toothpick inserted near centers comes out pretty clean. Cool bread in pans on wire rack 10 minutes. Using a narrow metal spatula or table knife, loosen sides of bread from pans. Remove breads from pans; cool completely on wire rack before slicing. The cooled bread may be wrapped in plastic wrap and kept at room temperature for up to 2 days. Refrigerate for a week or this bread freezes well for a couple months. When greasing the pans, you might feel compelled to grease the entire sides of the pan. Don't do this as the batter needs to grip the sides in order to rise well. I've used this method on even regular (not non-stick) pans with success. 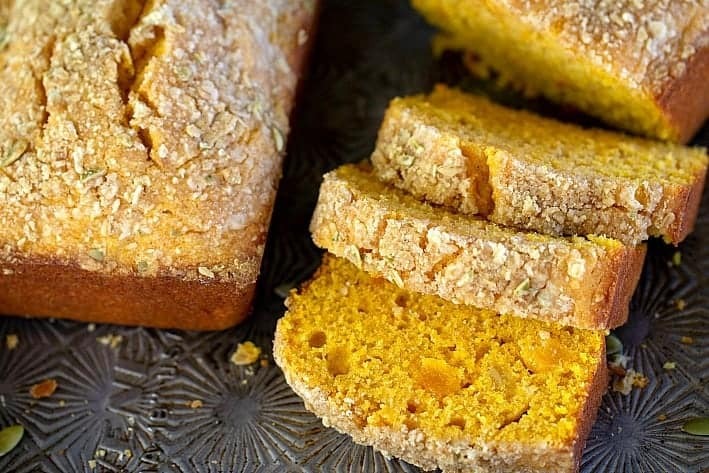 If you want to leave the streusel topping off the bread, you can bake the loaves without it or just sprinkle plain pumpkin seeds on top before baking. Don't skip the step where you soak the apricots. This softens them and makes them incorporate into the bread better. The loaves will most likely crack some on the top. Don't think you've failed, this it fine and normal and the loaves are still beautiful. Because I don't add as much sugar into the batter as an original recipe called for, the cracking happens. I don't recommend increasing the sugar because the texture of the bread is also more moist with the amount that I've indicated in the recipe. Wow, I love this combination! And little chunks of apricot?! How delicious! Thanks, Kes! We were pleasantly surprise .